Yes, the crowds were over the top. Yes, Patrick Reed was pumped. But isn’t that what golf keeps saying it needs? Great players getting emotionally charged is what we want, and this week we got it. Last week we said goodbye to Arnold Palmer, the man who revolutionised sports people in the public space. These days fans want to climb into the lives of sports pros, and in a way the Ryder Cup does that. We see them at their gritty best and saddest lows, all in the name of team and country. So why are there so few match play tournaments? We were fortunate enough to see Phil Mickelson and Henrik Stenson go head-to-head at the The Open, and then Stenson versus Justin Rose at the Olympics, but it was by chance. Those players should be locking horns more often, not playing the course but each other. Sponsors may be worried about big-name players dropping out early in a tournament, but team formats can help to prevent that. Consistency through the season is lauded, but something must be said for the streaky players, the ones who find magic in a bottle at certain times. Rory McIlroy, Rafa Cabrera-Bello, Brandt Snedeker and Reed all did that on Sunday. McIlroy was psyched up at the Tour Championship last week, but it was in a sudden-death playoff. The pressure and intensity of such moments is what we want to see, and in match play that begins on the first tee. Throughout the Ryder Cup there were commentators saying ‘in a normal tournament you would be trying to go down in two here,’ only to see their prediction defied when the putts dropped from long range. It was exhilarating. The crowds certainly played their part. A lot can be said of the boorish nature of some fans, but for the most part Team USA’s supporters took it easy after a warning. It’s easy to sit on a high horse and judge, but when last did a rugby kick for poles get struck without the precursory boo? Fans will always push the boundaries, because they want to participate, to influence the outcome for their team. So let’s put that can of worms aside and keep with the joy of match play. At dinner on Saturday I spoke golf with my oldest friends, a group of guys with zero interest in the game. They all knew about ‘that tournament between America and everyone else.’ Even non-golfers had been reached by the Ryder Cup. It’s easy to enjoy the atmosphere with such incredible scenes coming out of Hazeltine. Surely that can be recreated more often, surely there are big companies willing to bank on the success of a match play tournament? Eight teams with eight players each would complete a regular WGC-sized field, and the surprise combinations, like Cabrera-Bello and Sergio Garcia this weekend, makes for tantalising viewing. It’s also a fantastic way to grow the game. For Europe’s Chris Wood it must have been an exceptional experience to go head-to-head with Dustin Johnson, even though he lost the match. The two giants smashing balls in Minnesota must have been a dream come true for Wood, who surely have gained valuable experience. Likewise Brooks Koepka, a one-time PGA Tour winner, who beat Masters champ Danny Willett 5&4. Koepka hit some great shots, but it was crisp putting that denied his opponent a chance to equalise. Knowing that he can beat a major champion on the day is massive. 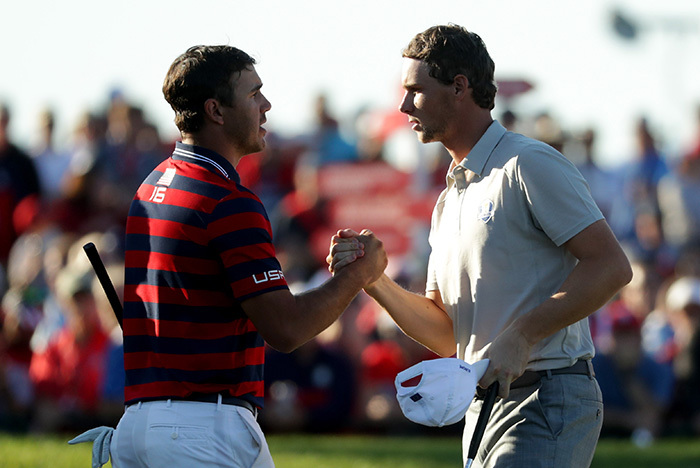 Match play is a great format that deserves more space in professional golf. I’m left wondering why we get so hyped up about the Ryder Cup, love it for three days, and then shelve the emotions until the next edition. Let’s get the roars going more often!